One of the largest urban parks in the world, the English Garden (Englischer Garten) is Munich’s most popular green space, boasting over 48 miles (78 kilometers) of walking and cycling trails. It offers plenty to explore, including a Japanese teahouse, a boating lake, and traditional beer gardens. 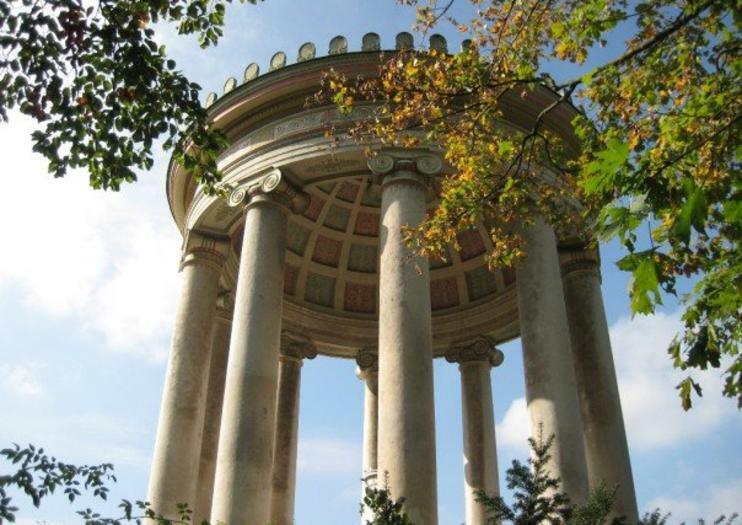 A sightseeing tour of Munich isn’t complete without a trip to the idyllic English Garden. Explore the gardens via a guided walking, bike or Segway tour, or as part of a hop-on hop-off Munich tour. Highlights within the park include paddleboat rental at Kleinhesseloher Lake and great views from the Greek temple of Monopteros. Wear comfortable shoes if you plan on walking, biking, or taking part in outdoor activities. Most of the park’s walking trails are wheelchair accessible. The English Garden is located just north of Munich's Old Town; it takes around 20 minutes to walk to the southern entrance from Marienplatz. To get there by public transport, ride the tram to Paradiesstrasse or Tivolistrasse, or take the U-bahn to Universitat, Giselastrasse, or Munchner Freiheit. The park is open year round, and while it can get busy on summer afternoons, it’s big enough that you’ll always be able to find a quiet spot. Head there during summer to watch the famous urban surfers along the River Eisbach and enjoy various open-air events and activities, or plan your trip during the cooler months of spring and autumn, which are ideal for walkers and runners. Once you’ve finished exploring, stop to admire the views from the Japanese Tea House or have a beer and enjoy the traditional brass bands at the Chinesischer Turm (Chinese tower) Biergarten, one of Munich’s largest beer gardens. Alternatively, tuck into bratwurst and beer at Osterwald or Hirschau beer gardens, or head to the Seehaus (Lake House), where you can drink beer overlooking the lake.